His hand in mine… We walked. Young… Vibrant… So full of life. We laughed… We dreamed of our future. Countless hours spent… Falling in love in the park. Your eyes… The depth of your love for me. The eyes of a 16 year old boy… madly in love. People said… It’s just a crush. In the park… Remains a bench with our initials carved inside. 18 years later… Our initials remain. Who would’ve known… Our love would too. Sitting under a wooden structure. You handed me a box. Inside the box… A necklace. 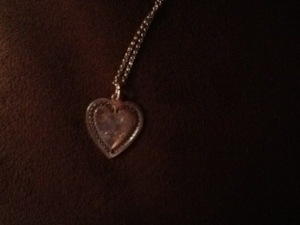 Today I wear this necklace… A reminder of our history. This necklace holds… So much of our story. A piece of jewelry… Given to a girl. A girl… You loved… You cherished… You romanced… You chased. You won my heart then… And you continue to win my heart today. 18 years later… We’re still madly in love. We have shared our past. I look forward to sharing our future. Your past… your present… your future.